Roof maintenance goes beyond inspections, repairs, and complete replacements. You need to clean your roof, too! Roof cleaning services aren’t hard to come by; however, it’s important to find the best roof cleaning company in South Florida to wash your roof regularly. As a Florida resident, you’ve probably noticed the dark streaks and stains across your roof (or your neighbors) from the front yard. They’re unsightly and ugly. Not only does your curb appeal suffer when this discoloration plagues your roof, but it could be a sign of potential roof damage, which will cost you substantially more to repair compared to roof cleaning costs. 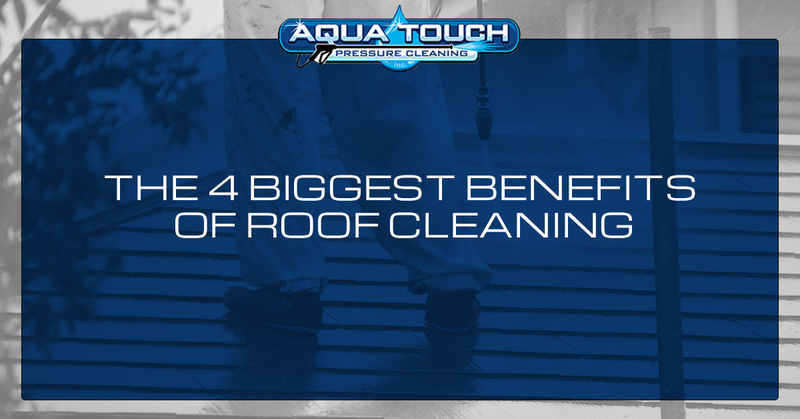 In this post, Aqua Touch Pressure Cleaning will share the four benefits of roof cleaning services for your home. Ready to discuss the cost of roof cleaning? Want a FREE quote? Contact us today! Otherwise, read on to learn more about roof and gutter cleaning benefits. If you’re not worried about your home’s curb appeal, you should. Nothing ruins a home’s beauty faster than a dirty, ugly roof. Don’t be that homeowner who ignores the stains or streaks of moss, lichen, or algae that stretch across your roof. It’s unsightly. Furthermore, if you’re attempting to sell your home, a clean, brilliant looking roof can improve your chances of someone buying. Did you know that the color of your roof can play a role in the energy efficiency of your home? Similar to vehicles, the darker the color, the more heat it absorbs. If it’s a lighter shade, the heat bounces off. The same concept applies to your roof. Additionally, streaks and stains can absorb/trap heat in your roof and decreases your energy efficiency. Keeping your roof clean of algae, moss, mold, etc, can help you keep your home more energy efficient. If your roof is dirty, littered with debris, or frequented by critters, this can lead to your gutters getting clogged. Once your gutters are clogged, you could run into issues with roof damage, foundation problems, or landscaping nightmares due to water flooding. Also, you could start seeing water stains streaking down the side of your home from dirty water overflow. Professional cleaning services prevent this from happening altogether. Climbing a roof is dangerous, even with the proper equipment and safety gear; it’s substantially more dangerous when your roof is dirty, littered with debris, or damaged. You could slip and fall off or through your roof if it’s not properly maintained. A great way to keep your roof in top-notch shape is a routine roof washing. It’s common to think that rainwater or the occasional storm will wash your roof clean. Unfortunately, this isn’t true. Mold, moss, lichen, algae and more exist on your roof because of the moisture in the air. It’s imperative to maintain your roof with roof cleaning services. Black, green, white, or other colored streaks down or across your roof are not “natural aging” marks of the roofing material you’ve chosen. These streaks are a sign you need a roof wash. Remember, roof cleaning isn’t as easy as spraying it down with a pressure washer. Most pressure washers are not gentle enough to properly clean your roof without damaging it. You want to use the SoftWash System offered by Aqua Touch Pressure Cleaning to get the best roof cleaning result. If your roof is dirty, and you need a roof wash, you want to hire a professional. Aqua Touch is your premiere roof cleaning company in South Florida. Our residential roof washing services are more than a pressure washer rinse. We use the SoftWash System to get your roof clean without damaging it. Don’t go another day with a dirty, ugly roof. Contact us now!